Set in Stone is a pair of interactive, touch-sensitive, concrete interfaces for transmitting presence across long distances. In today’s world we have many options for communicating with others. Sending an e-mail, making a phone call, or writing a letter all allow full ideas to be sent across to other people. However, there is no way to transmit the incidental or intentional touches of life. What about the pats on the back, the handshakes, ruffling someone’s hair, and holding hands. Touch is a different way of experiencing someone. When you put your hand up to a windowpane and I touch the other side it feels different. But what if the two sides of the windowpane were separated by miles of distance, how would you know I was there. If you put your hand on one of the set in stone interface the other lights up. When I put my hand on the lit one, yours lights up and you know I’m there. We can be connected by touch anywhere in the world. Set in Stone is able to be used by two people, but can be extended out to encompass more people. What if two people that would never have any contact would be able to send each other their touch, say a child in Iraq and a child in Kansas. The possibilities are endless. 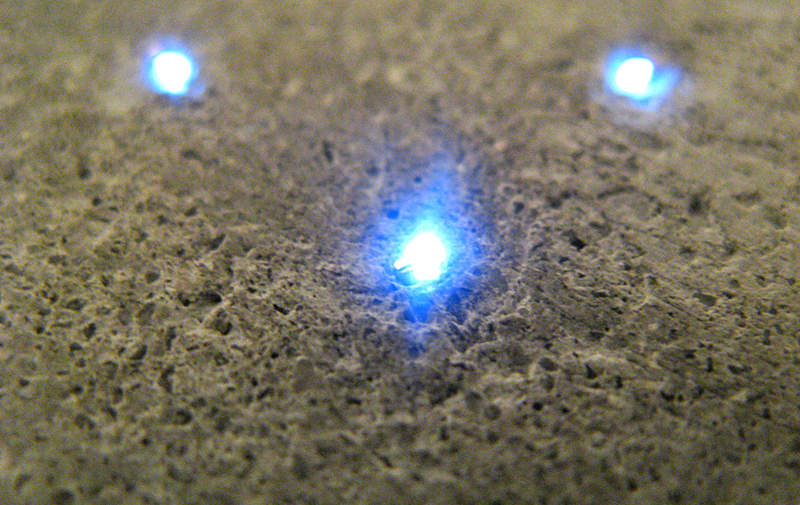 Each panel is made up of LED’s, fiber optics and concrete. More information on the project as well as the process of making Set in Stone is documented at the Set in Stone blog. Set in Stone was created by myself and Ithai Benjamin. It was also featured in Make Magazine.